The Weaver laboratories were built in sections over a period of years. Named after D. S. Weaver, the first Department Head. Weaver Labs was built on Faucette Drive which was named after NCSU alumni William D. Faucette 1881-1947. The original section of Weaver Labs was built in 1957. Weaver Administration Building and the 2nd section of Weaver Labs was built in 1960. The 3rd section of Weaver Labs including its 2nd floor was built in 1969. The Weaver garage building was built over a 10-year period as funds were available. Space for a future building was reserved (on the front lawn). 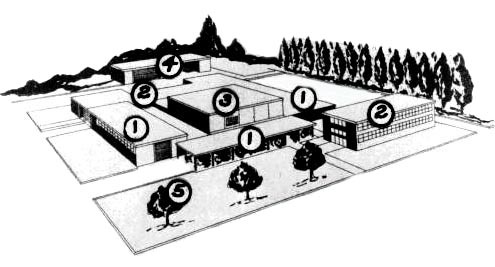 Weaver Laboratories was named after the first Department Head David S. Weaver the building was dedicated in honor in 1957. 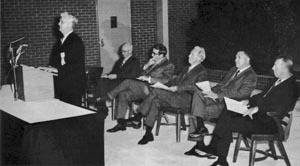 Weaver Labs 1957 dedication ceremony. Weaver served NC State for 40 years and dedicated his professional life to taking the drudgery out of farm work through the use of machinery. He kept a reproduction of Millet’s famous painting “The Man with the Hoe” in his office to remind him of his goal of mechanization. Students in the twenties, however, were amused by his prediction that they would live to see tractors replace mules. A native of Ohio, Weaver arrived at NC State to work on his master’s degree, which he obtained in 1925. After working as principal engineer for the new federal Rural Electrification Administration in Washington, D.C., he promoted REA work in N.C. and returned to NC State in 1937 as head of the agricultural department and specialist in charge. In 1950, Weaver succeeded I.O. Schaub as director of the Agricultural Extension Service. Afterwards, he became special assistant to the dean of agriculture until retirement. Weaver was known throughout the state as the “father of rural electrification.” He received numerous awards and an honorary Doctor of Humanities from the University in 1964. One of the best-known railroad engineers in the Southeast, Faucette was one of several college engineering graduates who had prominent careers with railroads. He was born in Halifax County. His father died shortly before his birth, but he was able to work and take advantage of the low college costs of that time. He entered State in 1897 at 16 and graduated in four years at 20 years old. Upon graduation he was employed by the Seaboard Coastline Railroad and remained there for his entire career, serving in engineering roles in Savannah and Norfolk. He then moved New York City and worked for the company president eventually being named a chief engineer. Never forgetting his Ala marta he was active in NC States affairs, serving as an alumni president in 1917-1918. He also had the distinction of being among one of the first NCSU alumni to be appointed to the new combined Board of Trustees when three institutions were consolidated in the early 1930’s. For his contributions the college awarded him and honorary Doctor of Science degree in 1929.